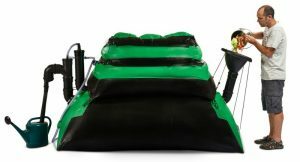 Invention produces homemade natural gas and fertilizer from food waste, grass clippings and livestock manure. The HomeBiogas 2.0 converts food scraps, yard waste and livestock manure into natural gas for cooking and fertilizer. Biogas is a mixture of flammable gases (mostly methane) and carbon dioxide that forms anywhere organic material decomposes without oxygen, such as under water, deep in a landfill, or in the guts of animals, explains renewable energy consultant Paul Scheckel in an article for Mother Earth News. 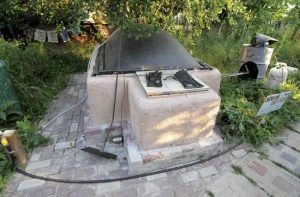 A simple 200 gallon tank with an inlet, two outlets, and organic “waste” material, is basically all you need to supply at least enough biogas for the average family’s cooking needs. Larger systems can be put together for meeting more energy needs including space heating, water heating or even powering a diesel or natural-gas car. A 600-gallon biogas generator in Oregon turns 15 pounds of food waste into cooking fuel daily. Designed by Hestia Home Biogas. “If you can compost it, a biomass generator can digest it,” Scheckel says. Nearly any combination of vegetables, food scraps, grass clippings, animal manure, meat, slaughterhouse waste and fats will work as long as your recipe contains the correct ratio of carbon and nitrogen, he says. Just avoid using too many woody products, such as wood chips and straw, which tend to clog up the digestion process. Once you’ve collected enough biomass, mix it with about ten times as much water and a starter culture of methane-producing organisms. (If you use manure, you won’t need microbes). Put the slurry in an airtight container, and keep it as close to body temperature as possible by putting it in the sun or a greenhouse. Your biogas should be ready in about a week. Release the biogas through a pipe into an airtight storage container. Through a larger outlet will come compostable solids and nutrient-rich liquid, which make an excellent soil amendments. I really love the information on your site but the amount of advertising makes it really hard to read I’m afraid. Even if all advertising was in one place and not in the middle of an article (I know many sites do this and it makes for a terrible user experience). I realize the advertising is probably very necessary for your site, but I hope this feedback is useful to you. I’ve had to stop sharing articles from you because I’ve had complaints from the fb page viewers about it.